I'm back! And I know I never mentioned that I was going to be gone, but that's because I fully intended on doing some long-distance blogging. However, that never worked out- because while I was in Atlanta for Passover and vacation, I kept myself pretty busy! But, no fear, I do have some great posts up my sleeve. First up: Lili Marlene's on Atwells. Andy and I headed there for several reasons. One, because we love Loie Fuller's, the owner of Lili's other restaurant. And two, because we heard from several sources that Lili's had some great, cheap food. It's really not quite tomato season yet, but these tomatoes were pretty good. 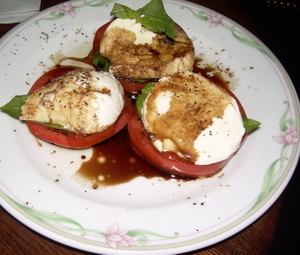 I also loved the generous slab of mozzarella on top of the tomatoes- often restaurants serve this dish with only a thin slice of mozzarella on top, but Lili's did it right. Just like the mozzarella, they did not skimp on the shrimp. You can see it literally pouring out of the sandwich! 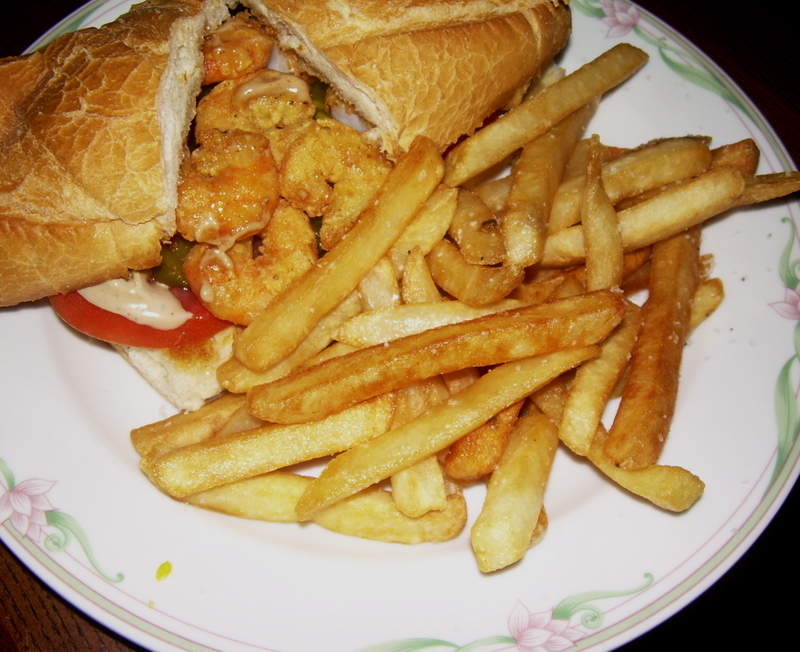 The shrimp were perfectly fried, and the toppings on the sandwich complimented them well- pickles, herbed mayonnaise. And the fries. Yum. Some people herald these fries as the best in Providence- and while I can't claim that because I'm not a huge fry eater, these were very very good. Andy had a chicken sandwich which I couldn't snap a good photo of (the restaurant is very dark, and my camera is awful- thankfully I am in the process of buying a new one!) but he liked it, but preferred my po' boy. I really think it is a star of the menu at Lili Marlene's. While we really enjoyed our food, Andy and I decided that Lili Marlene's is more a place for drinks, and for eating as an after thought, instead of a destination for dinner. Not because the food isn't good, but the ambiance does not lend itself to a weekend meal, especially as the nights get brighter and Lili Marlene's remains shrouded in darkness. We love Lilly's for there great cheap burgers! Yummy! And you're right, they're not really a dining destination, but if you're in the mood for a fast, cheap, good sandwich and a beer, it's a great place to go! hi it's very delicious, about delicious foods there are a internet portal in Germany, where you can order your delicious foods like pizza, pasta etc online: www.eat-star.de. Tomatoes have many properties and vitamin and if you eat it frequently is sure you will see more beautiful because the tomatoes contain antioxidant that help the skin to stay young longer. In fact i read a blog some days ago and i knew all the properties of the tomatoes. That is why i talk to bases.